Duct Cleaning Brushes use floppy nylon bristles to provide a gentle action which dislodges buildup and allows your duct cleaning vac to remove it effectively. 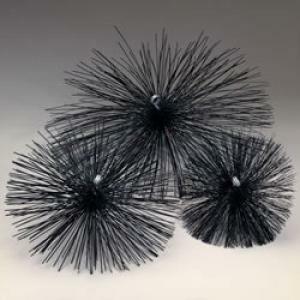 Duct cleaning brushes are made with 3/8" pipe threads for use with heavy-duty yellow fiberglass rods or professional duty black rods. Due to flexibility of the bristles, we recommend you "oversize" when cleaning. For example, in an 8" duct, a 12" brush will give the best results.